Okay, this might be a little crazy. 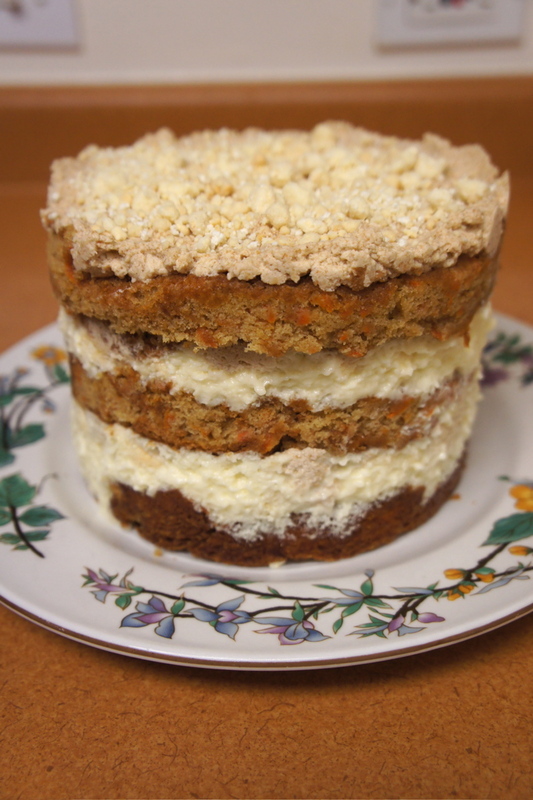 Making the Momofuku Carrot Layer Cake has been an epic journey that has taken four weeks. It started with Milk Crumbs, which I used to make the Blueberries and Cream Cookies. I only used half of the Crumbs and so I needed to use them in something else. I also wanted to make the Compost Cookies, which required 1/4 recipe of the Graham Crust. Having both Milk Crumbs and Graham Crust, I thought, I’ve come this far, I can make the Carrot Layer Cake. This would then require Carrot Cake + Liquid Cheesecake + Graham Frosting + obtain acetate strips from TAP Plastics and a 6″ cake ring from Sur la Table. I have baked cakes before, but nothing like this. To date, the only recipes that have topped this in terms of effort and time are the Momofuku Ramen Noodles and the Tartine Croissants. Onward. I started with the carrot cake, using organic carrots from the farmer’s market. 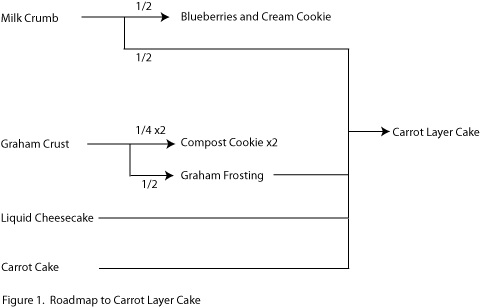 The carrot cake wasn’t overly complicated, and actually none of the components are technically difficult, but they do require a blender and stand mixer. A kitchen scale is helpful but not absolutely required. The most rewarding part was the assembly. I love it when a plan comes together. The carrot cake, topped with liquid cheesecake, sprinkled with milk crumbs, then topped with graham frosting. Set in the freezer overnight, and thaw in the refrigerator the next day for Thanksgiving dinner. 1. The book calls for a 10″ x 13″ pan, which I couldn’t find at Sur la Table or Target. A standard sized 9″ x 13″ pan was a little small for stamping out two 6″ cake layers. This can be corrected by using some cake trimmings. 2. When making the liquid cheesecake, regular grocery store plastic wrap will melt when baked at 300 F. Next time I would try using parchment paper or foil or maybe nothing at all. 3. If you prepare the graham frosting ahead of time and refrigerate it, wait for it to return to room temperature before spreading it on the cake. The verdict? The carrot cake is really moist and flavorful. Liquid cheesecake is delicious. 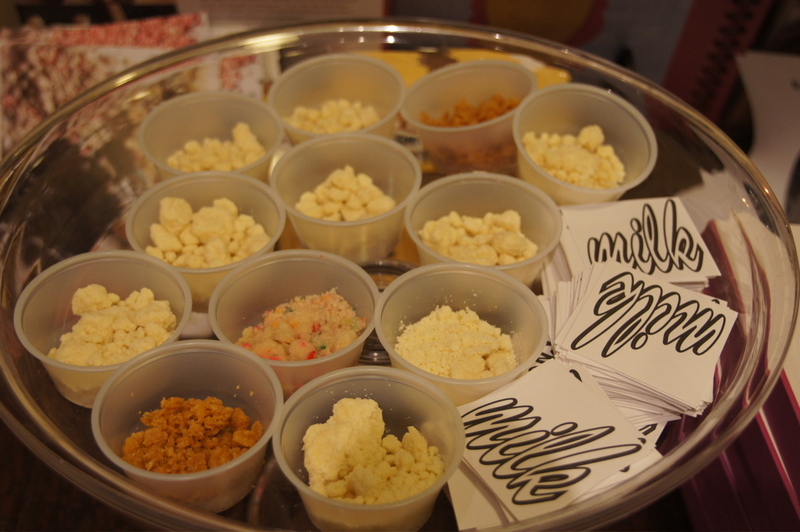 The milk crumb provides pops of flavor and texture. Graham frosting is buttery and creamy and delicious. Was it worth it? Totally. This hearty dish is Italian comfort food perfect for cool fall and winter evenings, from Andrew Carmellini’s Urban Italian cookbook. The rich, creamy sauce is made without the use of heavy cream or butter. The secret is that prepared tomato sauce is thickened with pureed chickpeas that add both flavor and texture. I have tried making Chef Carmellini’s basic tomato sauce in the past, but was not successful – I think that recipe calls for too much olive oil. Instead, I used my go-to basic tomato sauce, from Todd English’s Figs cookbook, as the base for this sauce. Cooking takes less than 30 minutes – brown some spicy Italian sausage, puree chickpeas in a blender, and simmer with tomato sauce for 15 minutes. Meanwhile, boil water, blanch the broccoli rabe for 90 seconds, then saute in olive oil, garlic, red pepper flakes, and chickpeas. 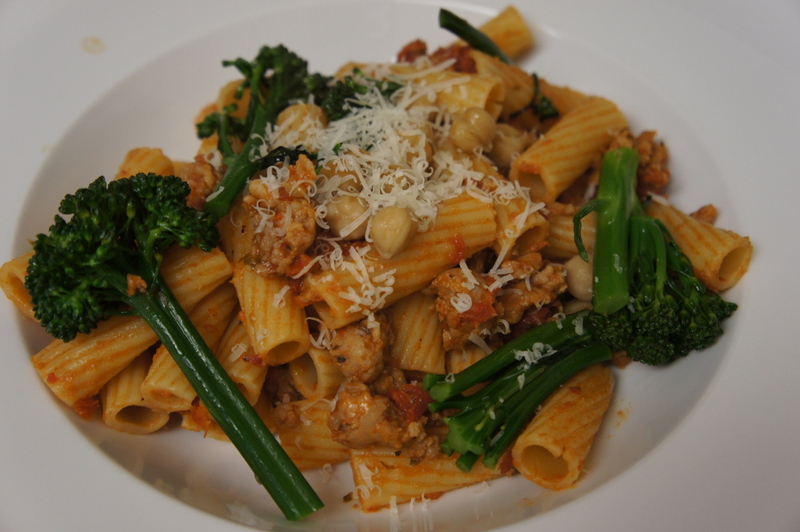 Boil the rigatoni, toss with the sauce, and top with the broccoli rabe, chickpeas, and grated parmesan or pecorino. The recipe calls for adding additional butter and olive oil when tossing the pasta with the sauce, but I think the sauce is definitely good enough to stand on its own. 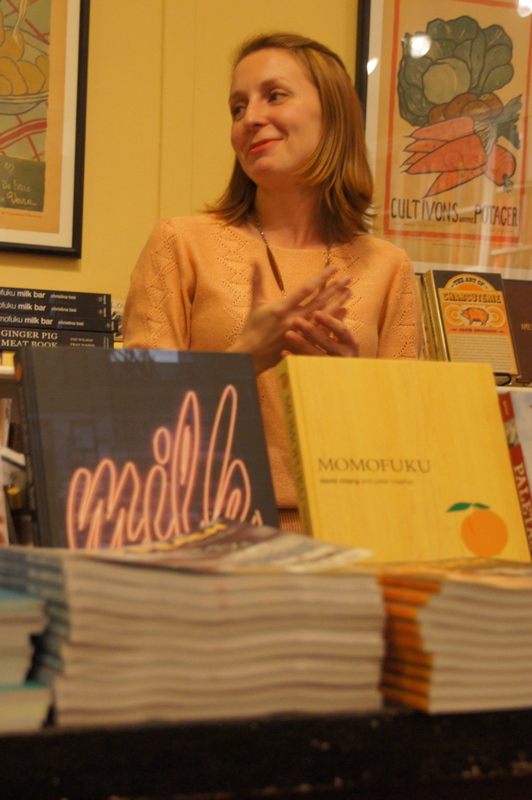 Christina Tosi, pastry chef of Momofuku Milk Bar stopped by San Francisco’s Omnivore Books on her book tour bringing conversation, cookies, birthday crumb, and cornflake crunch. She told the story about conceptualizing Momofuku Milk Bar with David Chang as a modernized Dairy Queen, updating classic American flavors with a new voice. She described the process behind coming up with new recipes and how it was part conceptual, part serendipity, and part practicality in working with what is available, whether on an island (compost cookies) or from your refrigerator (crack pie). She described the development of crumbs and crunches, little “pops” of flavors and textures that could be deployed in cookies, cakes, and plated desserts. She said the Momofuku way was to not put something on a menu unless it was absolutely delicious and the chef would stand behind it 100%. It was inspiring to hear this philosophy, which has probably played a big role in how fast the Milk Bar concept has spread in the past three years, from Chef Tosi fighting for open prep space at Ssam Bar to an operation with fifty employees, four locations in New York, and now a new cookbook. It was interesting to hear how they had to balance their menu to meet space and operational constraints, satisfy their returning customers, while also trying to add new or seasonal items. She said they are always innovating – she described a Thanksgiving croissant that sounded delicious – layering the dough with a compound butter made with stuffing spices, then stuffing the croissant with dark and white meat turkey and cranberry sauce. She was quite generous in bringing samples of birthday crumb, milk crumb, and cornflake crunch, as well as the famous cookies and stayed quite a while to sign books and talk with people. A very nice event. Another winner from Chef Suzanne Goin and the Luques cookbook. 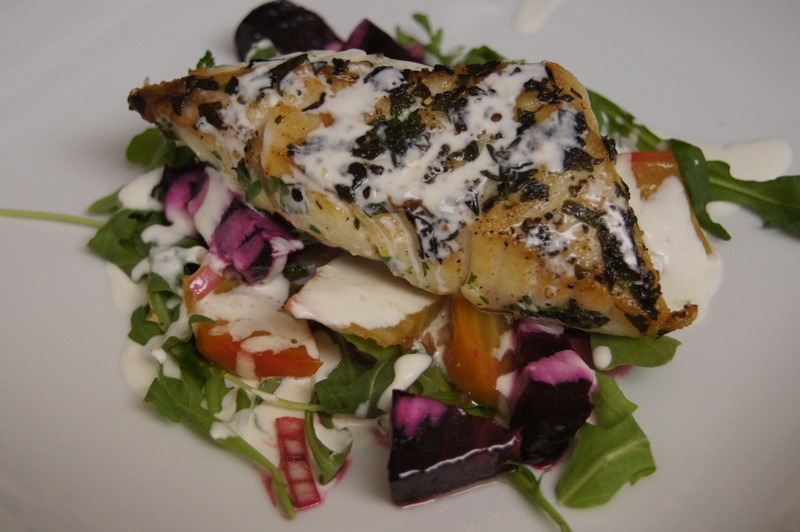 Great halibut from a local fisherman at the farmer’s market is sauteed and plated on a light salad of roasted beets and arugula dressed in a simple vinaigrette (shallot, red wine vinegar, balsamic vinegar, lemon juice, and EVOO). There are some gorgeous beets now available at the farmer’s market in a variety of colors. To roast, simply toss with a little olive oil and salt in a roasting pan, cover with foil, and place in the oven at 400 F for 45 minutes to an hour until tender, depending on the size of the beets. Then slip off the skin with your hands. The horseradish creme fraiche (creme fraiche, available at Trader Joe’s, prepared horseradish, lemon juice, and heavy cream) ties the whole dish together. The horseradish is an interesting addition, giving the sauce a subtle sharpness that complements the sweet roasted beets and enhances the mild-flavored halibut. Link to recipe here and link to beets recipe here. Suzanne Goin, the executive chef at Luques in Los Angeles, is one of my favorite chefs. Her sophisticated dishes have multiple layers of flavors and textures. This recipe is from the Luques cookbook that I use quite often. This recipe has a couple of sub-recipes, including Sicilian breadcrumbs – toasted breadcrumbs with shallots, parsley, toasted pine nuts, currants, and balsamic vinegar – and a ricotta pudding made with ricotta, milk, heavy cream, and eggs that is baked in a water bath in the oven. 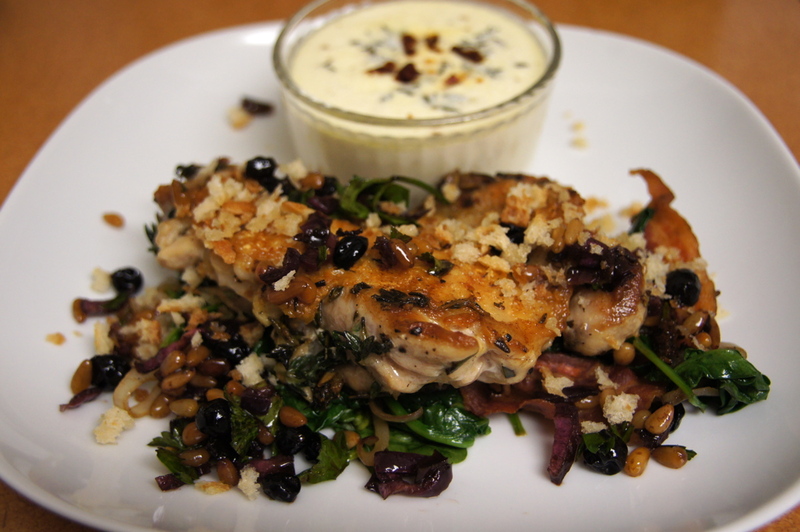 However, once everything is in place, the final assembly is easy – grill the chicken, saute shallots, pancetta, spinach, rosemary, and chile, top with the Sicilian breadcrumbs and serve with the ricotta pudding. The book calls for grilling quail on a barbecue, but I used skin-on, de-boned chicken leg/thighs in a grill pan. A really delicious dish.